NEW YORK -- A 25-year-old police officer shot in the head over the weekend while attempting to stop a man suspected of carrying a handgun died Monday from his injuries, the third New York City officer slain on duty in five months. Brian Moore, who was in a coma after undergoing brain surgery following the Saturday evening shooting, was pronounced dead at a Queens hospital with his family at his bedside, including a father, uncle and cousin who were police officers. Dozens of uniformed officers stood at attention outside the medical center and lined up down the block to salute the ambulance carrying his body out. "He proved himself to be an exceptional young officer," Police Commissioner William Bratton said, noting he had made more than 150 arrests in less than five years on the job and earned meritorious service medals. Blackwell has been charged with attempted murder and other crimes. He's being held without bail and hasn't entered a plea. His attorney has denied the charges. It's likely that the charges will be upgraded to murder. CBS New York reports that Blackwell, known on the street as "Hellraiser," has nine previous arrests on his record, including charges of attempted murder, robbery, weapons possession and assault on two officers, authorities said. In 2013 he was arrested on attempted grand larceny charges. That same year, he was also charged for assault on a police officer. Mayor Bill de Blasio mourned Moore's death. "For five years, Brian served with distinction and he put his life on the line each day to keep us all safe," he said in a statement. 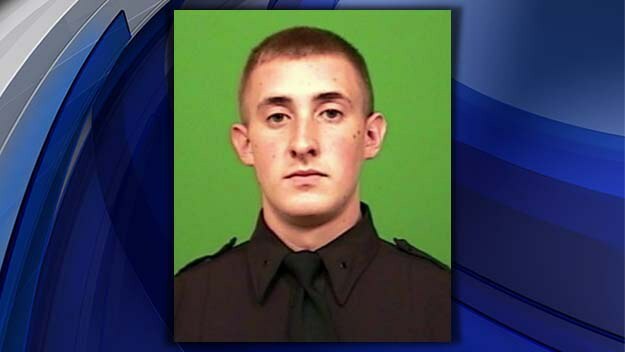 "On Saturday, he made the ultimate sacrifice in service to the people of New York City." President Barack Obama, speaking in the Bronx, saluted Moore's service and said officers around the country "deserve our gratitude." And Gov. Andrew Cuomo said in a statement Moore's shooting was a "deplorable act of violence." Patrick Lynch, who heads the rank-and-file police officers' union, joined Moore's family at the hospital and told reporters afterward that the city's police force would pay their respects, and then return to their posts patrolling streets, stairwells and subways. "They may have sadness in their eyes, but they have bravery in the hearts," he said. Moore had been on the job since July 2010, officials said. Flags at police headquarters were flying at half-staff Monday. Moore, who comes from a family of police officers, had been on the job since July 2010, officials said. He was rushed to the hospital in a patrol car after his partner radioed for help immediately following the shooting. He is the first city officer to be killed on duty since two uniformed police officers were slain in December while sitting in their patrol car in Brooklyn. Officers Wenjian Liu, 32, and Rafael Ramos, 40, were shot at close range as they were sitting in their patrol car Dec. 20 in Brooklyn. The gunman, 28-year-old Ismaaiyl Brinsley, then ran into a nearby subway station and fatally shot himself. Before the ambush, Brinsley posted on an Instagram account that he was planning to shoot two "pigs" in retaliation for Garner's death. Officials have said Blackwell made no such postings and had an extensive criminal history, including serving five years in prison on an attempted murder conviction. In January, two plainclothes officers in an anti-crime unit survived being struck by two gunshots each in the Bronx. They survived.